On Saturday night (July 5) after dinner, Sant Ji was not feeling well. Early Sunday morning, He told Gurmel to go to Raisingh Nagar to get some medicine. Gurmel brought the medicine, and after that Sant Ji felt much better. Around 9 o' clock Sunday morning Sant Ji said, "Let us go to the doctor and have the check-up done, so that if we have any doubt then let that be removed." Then Sant Ji went personally to the doctor. He saw the doctor and the doctor suggested ultrasound and some other tests which they did. They got the reports right away and everything was normal. The doctor said, "You just have some little bit of weakness, and maybe the kidney problem which you had a couple years ago, maybe because of that you are feeling this weakness. So you take this medicine and you will be all right." So Sant Ji came back from the doctor, and when I reached there Sant Ji had just come back from seeing the doctor. The doctor had suggested intravenous fluid, which they had given Him. So Sant Ji called me as soon as I got there, and He was lying on the bed with His IV stuff hooked up. And He was weak, but I will not say that He was terribly sick. So when I got there He held my hand and arm very firmly and asked about Shashi and the children. And then He told me what had happened earlier in the night, how He was not feeling well, so He sent Gurmel and Gurmel brought the medicine, and then He felt better, but that then He had gone to the doctor, and now He was feeling okay. And that's all He said. He didn't say anything about the Tour right at that time. And then He said, "Well okay, now you should go and eat and rest since you've been driving since morning." So I went and we ate and I just slept. "Everything is in the Will of Lord Kirpal. We had planned that we would go, but whatever we plan, He has His own plans. So you should go back to Delhi and you should call the dear ones and tell them that everything is in Lord Kirpal's Will, that whatever efforts they have made have not been wasted, it is all counted in their devotion; but it is not in the Will that I come this time, because I am very weak and I don't think I can do the Tour with this kind of weakness. And I feel very burdened about this, and if Kirpal wants to make me work then next year we will do this program in the month of May instead of July. This time if we had gone in May it would have been fine, because I was feeling fine in May." Then Gurmel said, "Maybe Pappu could go to Ganganagar and call the people from there and then come back to the ashram and spend another day there." Sant Ji said, "No, let him go, because he has a huge responsibility on his head. This Tour business is very serious. Let him go and talk to the people directly and tell them that I am sorry, it cannot be done." He said, "You should leave very early in the morning." I said, "Fine." So I was going to come back with the news that the Tour had been cancelled. After that Sant Ji was feeling fine. He did a little bit of walking also. And then at 9 o" clock, after taking something to eat, He went to bed. But since He was feeling weak, as also the night before, Sant Ji had asked Ajit Singh and Nirmal Singh (Gurmel's father and uncle) to stay with Him. They said that Sant Ji went to bed at 9 o' clock, and until 10:15 He was sleeping very well. But at 10:15 He woke up all of a sudden and said that He was feeling some burning in His chest. (This was not at the heart but right in the middle of the chest.) He was taken to the bathroom by both of them, and when He came back He still felt uneasiness but it was bearable. But by 11:15 it became unbearable and He said to call Gurmel. Gurmel came and took His blood pressure and did some other tests and everything was normal. Then all of sudden Sant Ji started losing His breath; it became very difficult for Him to breathe. Then Gurmel asked Him, "Should we go to the doctor?" 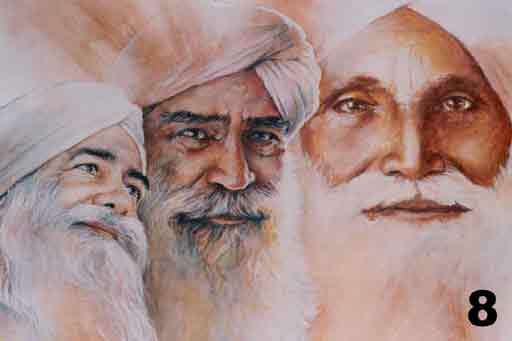 Sant Ji said, "Yes, I have reached my limit." When they arrived at the hospital in Raisingh Nagar, even though it was the middle of the night, the doctor was right there. He saw Sant Ji and at once he said, "This is a very serious heart attack." The heart specialist was summoned and he said to Sant Ji, "Open your mouth and show your tongue." Sant Ji opened His mouth and even opened His eyes. The doctor said, "He needs oxygen." So they got a stretcher to take Him to get oxygen, and as He was getting onto the stretcher, in one second He was gone. He didn't show anything; He didn't say anything. But the heart specialist said, "His breathing has stopped." It was two minutes before midnight on July 6 when He left. Four or five days before He left, Sant Ji wrote a bhajan and read it to Bant. In the bhajan it was very clear that He was leaving, and Bant was worried. She said, "Well, what is this?" Sant Ji said, "Well, no, no, no, it is nothing. I have just written this to quiet those people who make the predictions about my health, and about my leaving, and all that." He was going to give the bhajan to Gurmel, as He always does, to set the tune for it. Then He said, "No, not now, I will give this to you later." And nobody saw the bhajan again and nobody thought about it. And only after He left, Bant brought that bhajan to me and it was very clear. In 1986 Sant Ji had recorded a tape in Gurmel's presence and given it to Gurmel. The tape is addressed to the whole sangat. In that tape He left very clear instructions for everybody. He said that He had transferred His property to Bant and Gurmel, so that there would be no controversies about the ownership of the property. Then He talked about the guruship. He said, "This business of becoming the Master is very dangerous, and nobody should become a false master and nobody should follow a false master. If you people will follow the Path which I have shown you, if you will do your own Bhajan and Simran and your devotion with much faith and love and devotion, then definitely God Almighty Kirpal will show you the way. If you come across someone who has done so much meditation as I have done, and someone who has realized his Master after doing the meditation, then you may take advantage of him and even I will help you in that." For Gurmel and Bant and other people at the ashram, He clearly instructed that they don't have to leave the ashram, they don't have to do anything. The ashram is their place and they just have to earn their living and live their life. They only have to do the monthly Satsang as Sant Ji used to do; they have to continue with this program of conducting the Satsang but with the tape. And nobody has to deal with this Initiation business. He said, " The Initiations were given only as long as I am in the body, and nobody should play with this, as it is a very difficult thing." He said that false gurus grow like mushrooms, and nobody should get into any controversy about the successor ship. He told the ashram people there that if they follow the true teachings, God Kirpal will Himself guide them to the Truth. He said that He wanted the remains of His body to be plowed into a field at the ashram: no tomb, no monument, no place where people will come and bow down. The cremation took place at 3:00 o' clock. Pappu said, "There seemed to be so little flesh. It was as if all there was was glory and splendor-that everything we saw on the outer frame was glory and grace and there was nothing much to be consumed by the flames. All the pains and sufferings on His body were gone. It was amazing grace." "We could feel that Sant Ji's Power is very strong at the ashram. With His grace, it has been so wonderful in the ashram. Many people came for the cremation, many people came today when we were collecting the bones, and everything has been so disciplined and so peaceful and so loving. There was not even one sight of people getting together and forming groups or gossiping or talking or asking questions like, "who is going to be the successor?" or "Where has the Light gone?" etc. We all are feeling like we are doing a program in Sant Ji's presence." "It is no doubt a difficult time, but He is holding us together. I think for everybody His message is, as He said, "If you will do what I have taught you, and if you will have faith and devotion, then definitely God Almighty Kirpal will show you the way."